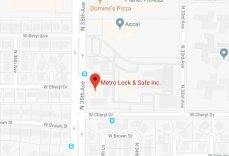 How You Can Identify a Reputable Locksmith | Metro Lock & Safe Inc.
Posted on October 20th, 2013 by Metro Lock & Safe Inc.
Lockouts either at home or with your car can be very frustrating especially if you are in a hurry or do not have a spare set of keys. This could happen if you lose or forget your keys or the locks are changed. In the end you might have to hire a locksmith to help you out of that situation. This is where you need to be careful so that you only pick the reputable locksmith who will give you the services you need. You should not compromise on your security or that of your property by being lax when selecting a locksmith. Doing some research on the locksmiths can help save you a lot of headaches later. You should do this beforehand. You should have done a background check on certain locksmiths and have their contacts even before you need their services. This is because you never know when you might have the lockout and at that time you might not be able to carry out any checks. Referrals are one of the surest ways to identify a reputable locksmith. You should seek recommendations from friends and relatives on who to contact for all problems with your locks. This will probably narrow your search to just one or two professionals whose names are repeated by your acquaintances. You can be assured of the service you get from these people just as you trust the advice you get from those you ask for recommendations. A reputable locksmith will also specialize in one area of the profession. There are too many types of locks for one locksmith to claim to have knowledge on. They will not be able to offer the quality of service you need if they juggle too many jobs. For instance, they could be commercial locksmiths who are specialized with the type of locks found in business and governmental facilities. Residential locksmiths on the other hand specialize in opening doors as well as fabricating or duplicating keys. They are also likely to know about automotive locks. These locksmiths will also have knowledge in designing security systems for the various systems. Since they are the ones who design the locks in the best place, they are best suited to ensuring the security of the entire premises. This is why it is important that you pick people whose integrity is not in doubt. You can also tell whether a locksmith is knowledgeable in the field by just talking to him. He should be able to explain to you the problem easily. Anyone who tries to use big terms and complicated language should not be trusted as they might also not know what they are doing. A locksmith of good repute will constantly update his tools with the changing technology. This means he will not come to unlock your car with a hammer. He will have the necessary transponder keys as well as other state of the art equipment to handle the problem. He should gain entry without causing any damage to the door. He should be able to re-cut or reprogram the key and lock afterwards so that you are secured once again.